If you step into a room of developers who are accustomed to working with SQL and you suggest a document database for a data model because you know the data fit the model, you may experience resistance (though less today since these databases have been around longer). 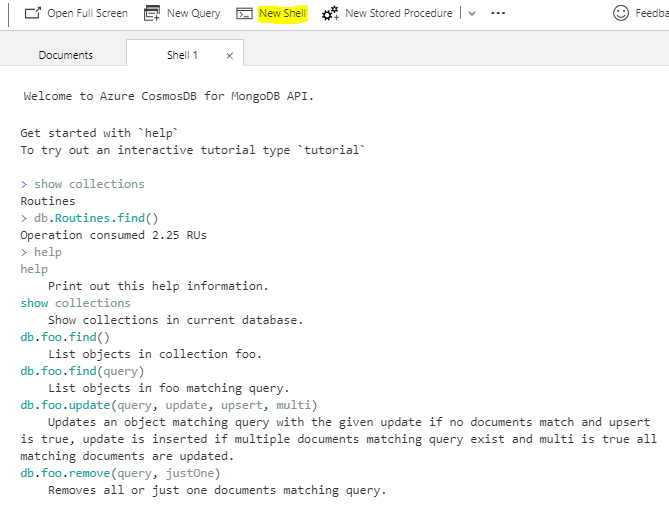 Unfortunately, since document databases like Azure Cosmos DB are still relatively new, you will need to know why they’re appropriate in some contexts. In addition, document databases can be integrated with SQL databases, where a document database is a source of data (like file systems are sometimes a source of data) with values being extracted for reporting in a SQL database. We have a document-like database that we use regularly – the file system. This analogy is the easiest to relate to because the file system can store many different types of files with different structures while still keeping some meta-information that we can query, such as the name, creation and modified time, the file type, etc. The second point is key: a document database, like Azure Cosmos DB, is not like a used car dump where we dump data and hope to find it later – we still need a structure that we’ll query by, even if the rest of the document has a different structure. These files all share the same file path and have metadata (name, create date, etc), but differ in structure. We don’t need to know details about these for this example, other than they differ in their workout category and they’ll follow different structures in their documents (as we’ll see). In addition, we may have multiple documents with the same category of workout, but never at the same exact time for an individual. Either create a new resource group or select an existing resource group you want to use (pictured, but intentionally left blank). The name must be unique since we’re using the .documents.azure.com, so come up with a unique name. We will leave off Geo-Redundancy and Multi-region Writes, but as we’re setting this up, consider these as options that may be useful in your context. Click “Review and create” and it will confirm your selections before creating. Setting up a new Cosmos database. 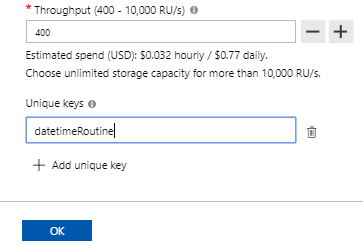 The above options show the naming of the database, collection, storage options, and unique keys along with RU/s. Once the database and collection is created, click “Documents” which will have nothing in it at first. We can use a shell to run operations on the database level. 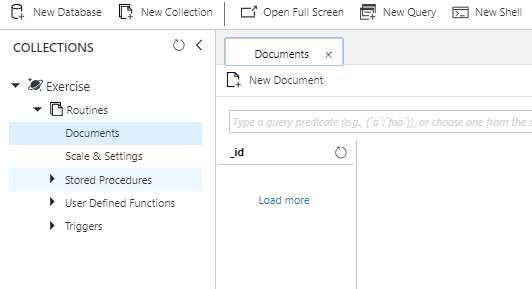 In the below image, we see that I first searched for the collections (“show collections”), then searched for all documents in the collection (db.Routines.find()), which result in nothing because there are no documents. We can use the shell for interacting with our Azure Cosmos DB, especially if we’re more comfortable with it. We’ve created our first document using the shell in Azure Cosmos DB, while receiving the total used RUs for the operation. We see our first document we created through the Shell. We have defined a unique key that prevents us from inserting the same datetimeRoutine. We see the blank document – we do not need to use this id field and if it appears, it can be removed. The id field of _id cannot be removed. The result of our query for the endurance workout routine. The result of our query for all documents. We see different structures for our documents in this collection, but we also see that we have field which help us identify what they are. 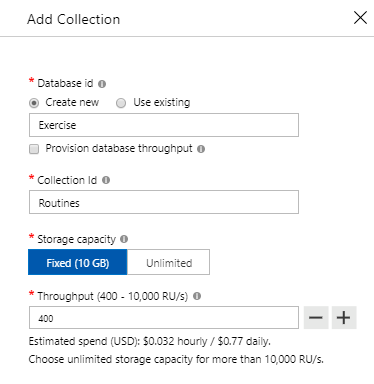 This is important because we’re not treating our Azure Cosmos DB as a car dump where we push data into it and devise ways to extract the data later – we’ve thought about how our individual user will query this database – by date and workout type – and we’ve used these as fields in our database. 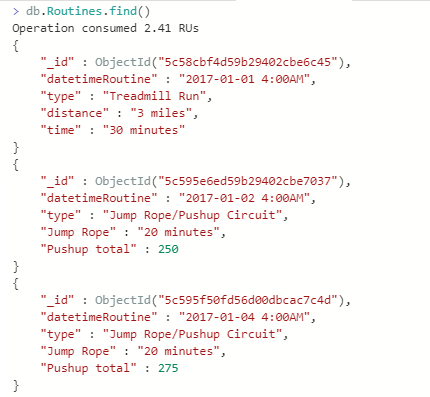 In this part, we looked at an example involving an individual’s fitness routine because most people committed to fitness will challenge their body differently over time, which would lead to a very convoluted SQL table structure (while we see 3 routines, over time it would be in the 100s). 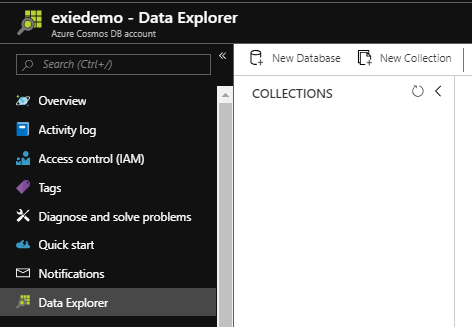 NoSQL databases, like Azure Cosmos DB, allow for the flexibility of these constantly evolving data models while keeping them grounded by a main key or two that tends to be involved in the querying or order. In addition, a NoSQL database may be a data store for data extraction that populates a SQL database for further analysis in some cases – hybrid models with NoSQL and SQL exist just like we have file systems that feed SQL databases.